Introduce a new generation of music enthusiasts to 17 legendary jazz artists who have enriched the world with their incredible talents. 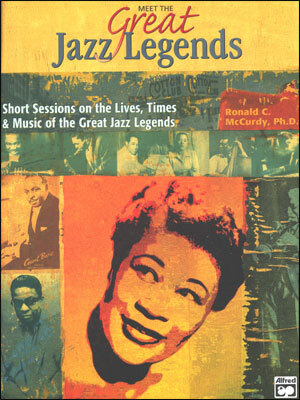 Dr. McCurdy's illuminating stories about the lives, times and music of these great jazz musicians span the entire twentieth century, from early New Orleans Jazz through the Golden Age of Swing plus the avant-garde and jazz fusion eras. Includes units on Louis Armstrong, James P. Johnson, Duke Ellington, Count Basie, Benny Goodman, Ella Fitzgerald, Billie Holiday, Charlie Parker, Dizzy Gillespie, Thelonius Monk, Miles Davis, Dave Brubeck, Clifford Brown, John Coltrane, Bill Evans, Charles Mingus and Herbie Hancock. For a budget-saving option, this Classroom Kit includes the Book and Reproducible Activity Sheets.